AKG’s Perception line of Mics is designed in Austria and manufactured in China. 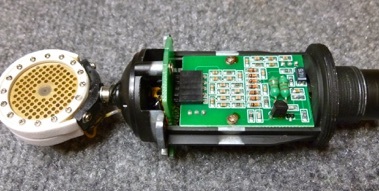 They are similar in construction to AKG’s higher end European mics, with heavy cast bodies and multiple plug-together PC boards with surface mount components. 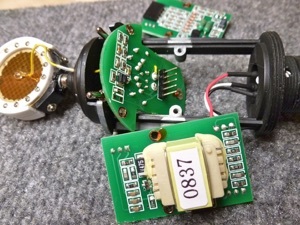 The components and capsules are Chinese. 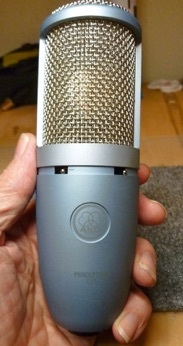 In particular, the capsule is a copy of a Neumann K67, the most common type used in inexpensive Chinese mics. The middle member of AKG’s family of inexpensive LDC mics made in China. The 220 has a cardioid-only capsule with only one side active. The back side has a clear mylar diaphragm without metallization. There are low-cut filter and 20-dB pad switches on the mic’s front. 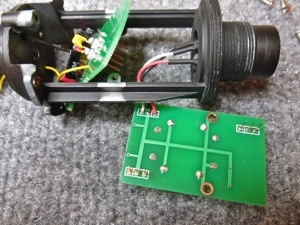 The output stage is on one PCB, containing the output emitter follower, output transformer, RF filters, and phantom power resistors and filter. 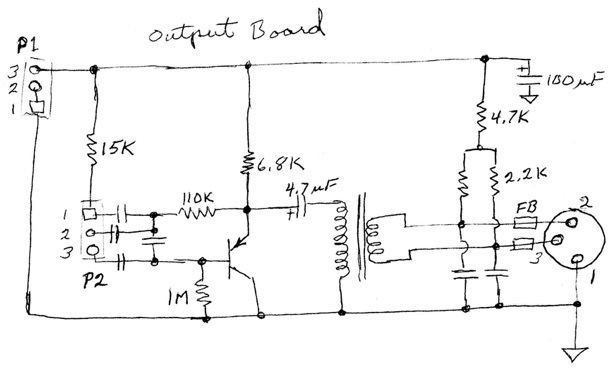 Here’s a sketch as beeped out with a voltmeter. Capacitors etc. 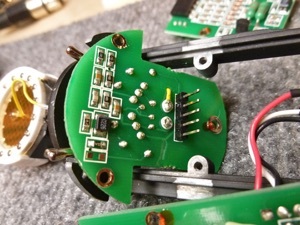 without a value noted are unmarked surface mount parts. Your guess is as good as mine. Bear in mind there are likely some errors here. 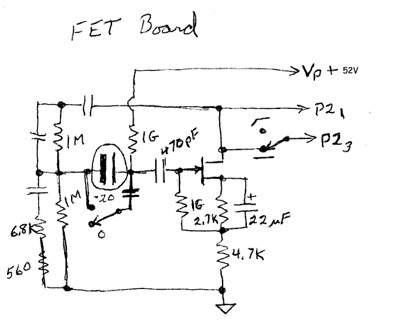 F’rinstance the output transistor might be an NPN common emitter, but the voltages say PNP emitter follower. 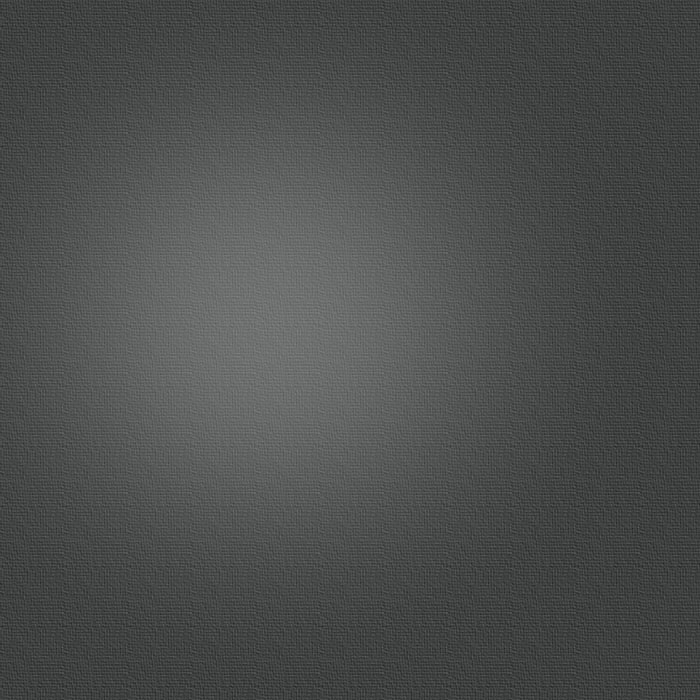 Unmarked part. 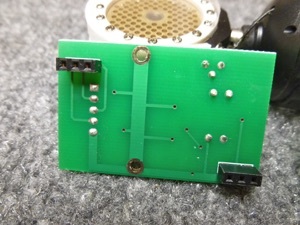 The output board plugs into the power supply board which contains an oscillator and voltage doubler for approx. 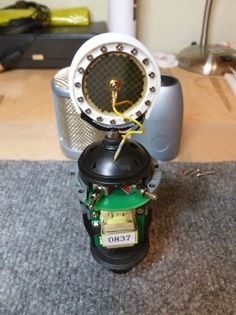 52V capsule bias. 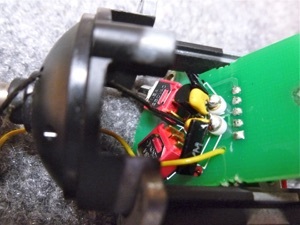 There are also +12V and -12V bias supplies which are not connected to anything, probably copied from the U87 where they are also unused. 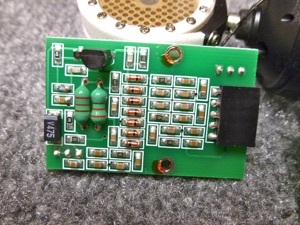 The power board plugs into the FET board which contains the capsule input circuitry. The FET gate and capsule center lead are built on standoffs which support the high impedance ends of the 1 gigohm resistors and the input coupling capacitor, which is a 470 pF ceramic. A possible upgrade by replacing that cap with a film type? Notable features include the 20 dB capacitive pad and the LF cut switch, which feeds the filter circuit on the output board. Note also the negative feedback applied to the “ground” side of the capsule to flatten the HF response. Again the capacitors in question are unmarked surface mount parts on the bottom of the board. Notice the similarity to the MXL 2001 schematic here, and the Neumann U87 here. I’ll measure the frequency response of the electronics later. The Perception 220 circuit tames the high frequency peak inherent in a K67-type capsule pretty well, and gives an AKG corporate character to the mic, though it doesn’t sound like the C-12 family. For that, you’d want an edge-terminated capsule and somewhat different EQ in the electronics. The pad does affect frequency response, as any pad does, and IMHO the mic sounds better without the pad. One of the better sounding mics under $200, it may respond to tweaks. . .